My carpet tote bag is the result of my never-ending desire to make bags with unusual materials. It's also, the result from impulse buying… I was looking for some materials that I could use instead of leather, and I was practicing my usual “whatever catches my eye” technique. This is something I do often, I tell the shop assistant “don't mind me, I will know what I want when I see it”. Then I spotted it among upholstery fabric. Normally, I would go home and sit down to sketch out a few ideas, drape it in the dummy and settle for one design. Then I'd stick with it until it is done. However, I have never worked with this material before and the point of this exercise is to come up with a bag that can be replicated in leather. The simple reason is that I still lack a bit of confidence to cut the leather and sew it. You get only one chance. That's it! I'm sure many of you have felt like this at one time or another, anxious about cutting a beautiful fabric or piece of leather. What would be the best way to gain confidence? My answer is coming up with a few special projects that you can experiment with before diving into the leather. So here I present to you my carpet tote bag, YES! you read right, I am using a type of flooring. 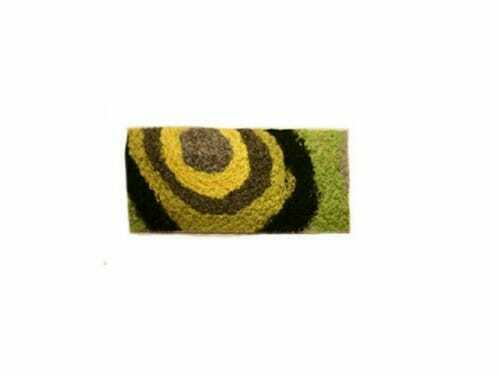 This carpet has a felt like-appearance and it does not ravel which makes it perfect for pretending it is leather. 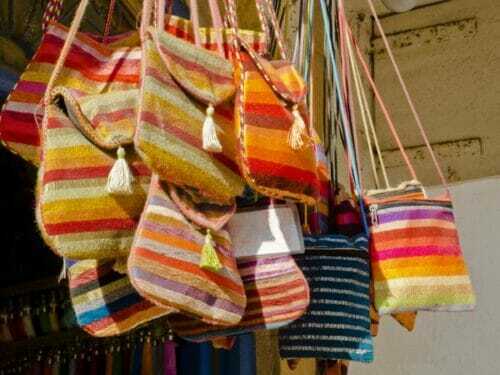 For those of you who are fond of recycling and have an old low pile carpet or mat, you might want to try and turn it into a few bags. It has a pocket in the outside which is nine inches wide and deep enough for an iPad. 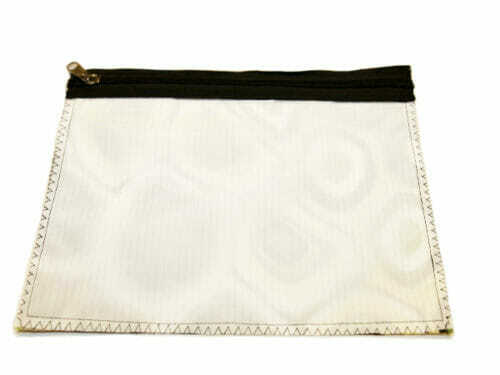 It has the possibility of being worn as a crossbody messenger. Or, as a handheld tote bag. WARNING: the following project is an experiment. I am playing with shape, proportion, material and finish. Consider this my muslin. My source of inspiration was a trip to the Old Muttrah Souq in Muscat, Oman in 2016. 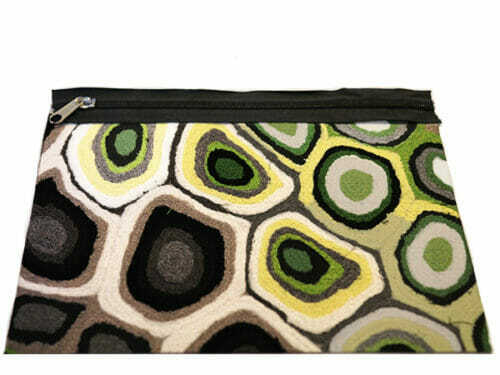 This carpet tote bag is wide enough to carry a large tablet or a laptop. It has a detachable pocket for your phone, wallet or sunglasses which is not included on this tutorial but will be added on a later date. Speedy Stitcher, industrial machine (optional) or a home sewing machine capable of sewing thick material. You can download the pattern for this Carpet Tote Bag from our account at Craftsy. 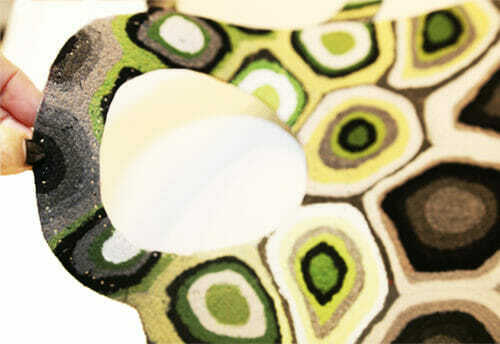 The pattern will only show you the front side of the carpet tote bag. To make the back of the tote all you need to do is to flip the pattern right side up to make a mirror image. The best procedure would be to use a chalk and trace the pattern directly onto the material and cut using a craft knife. You know you have done it well when the pattern looks like the picture below. The tote bag is not lined, but there is a pocket and you cannot see the lining from the inside. There is a way to make pockets in unlined coats and trousers and we will be using this technique to make the outside pocket. The use of a walking foot is highly recommended if your machine cannot handle the thickness of the material you're using. 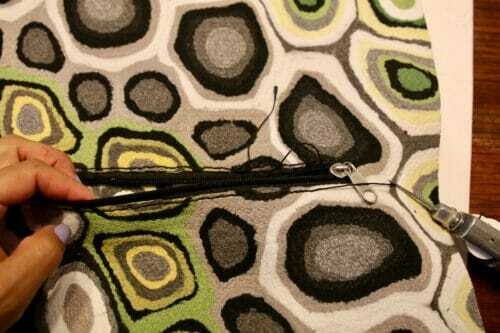 I will try to use my speedy stitcher, as an exercise to teach myself to make straight stitches. We will start attaching the zipper and the inner pocket, then we will apply all the hardware and finally assemble the carpet tote bag. Cut the rectangles using the pieces provided in the pattern. 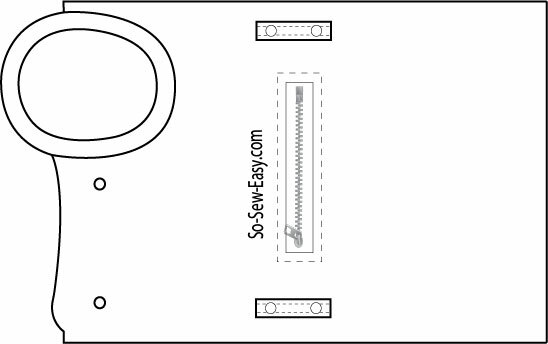 With the print material right side up, place the zipper with the head on the left side aligned with the top of the rectangle. 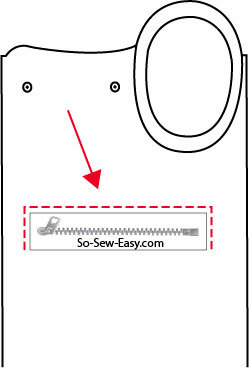 Sew the zipper at 1/4″. The carpet material will be facing right side up. 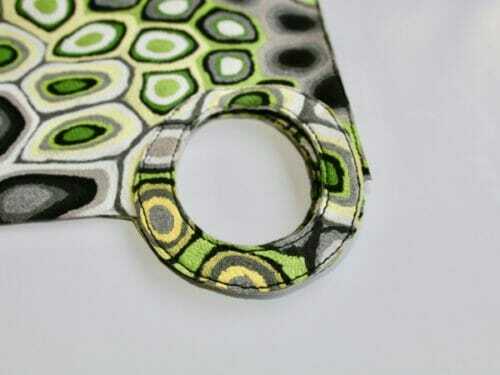 Place the lining fabric under the zipper and on top of the carpet material, sew at 1/4″. Topstitch to lay the zipper flat and to avoid the lining getting cut on the zipper. Zigzag around the side and lower edges to prevent the lining from ravel. Use your serger if you have one. 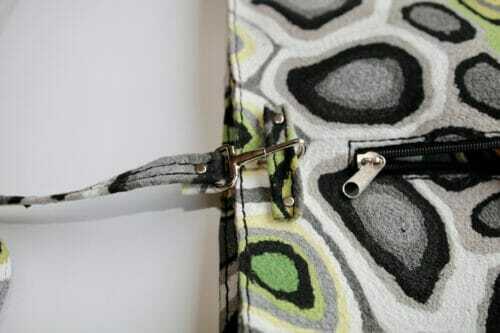 Use double-sided tape or glue to place the zipper on the opening. If you are using glue, let the glue dry for about 20 minutes to avoid your needle getting a residue that will make your stitching uneven. Topstitch from one side to the top, then to the other side. Open the zipper and topstitch the bottom part of the zipper. 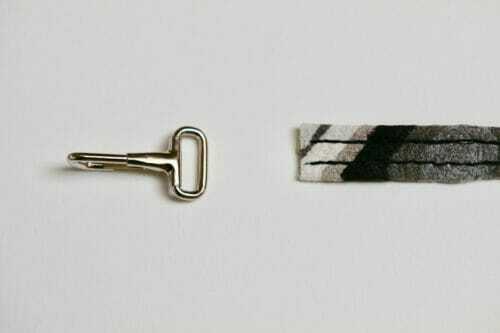 You will know it is right when you open the zipper you see the outer material and can insert your hand into the pocket. We are now going to attach all the necessary hardware. There are going to be two snaps above the zipper and four rivets to either side of the zipper. The rivets are to attach a strip of material that I will attach a removable strap and be able to make this carpet tote bag a crossbody messenger bag. There will be enough room to carry my laptop. 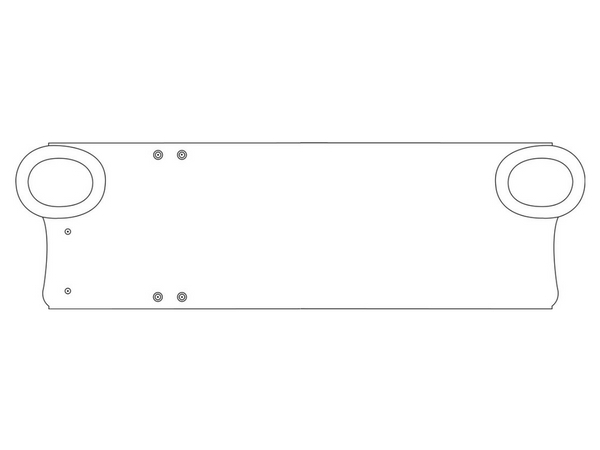 Cut two rectangles 2.5″ (6.4cm) X 1.5″(4cm). 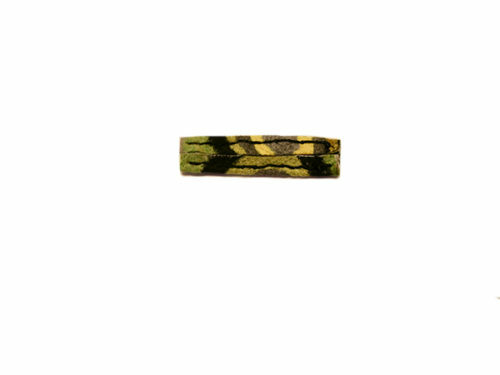 Fold 3/8″(1cm) and sew in the middle. 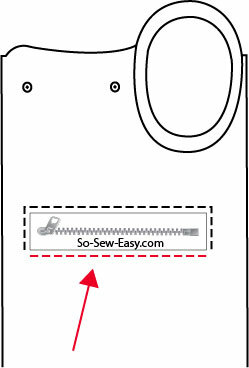 Fold the other 3/8″(1cm) and sew in the middle. Attach this strip of fabric with the rivets. 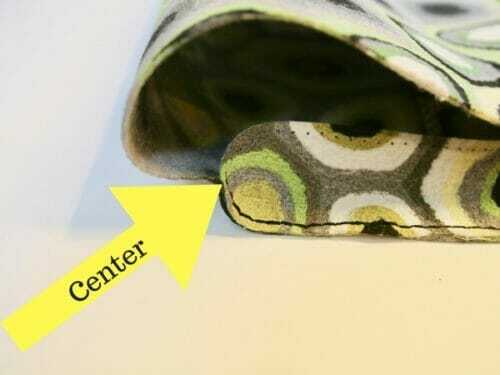 Apply glue to the handles and sew 1/8″ from the edge both in the outer and inner oval. Note: I attempted to use my speedy stitcher but found that my stitches were absolutely ugly. So I ripped the stitches out and discovered these large holes that are hard to disguise and weakened the material. Both are problems I will encounter if I use leather, so how to fix this? 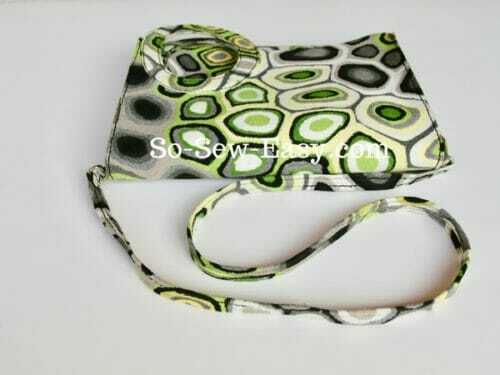 My solution was to cut two handles and sew them at the same time which means I will have three layers to sew. Now for sure, my machine will never be able to handle this. Double side interfacing for patchwork could work wonders here, however, I do not have any at hand. 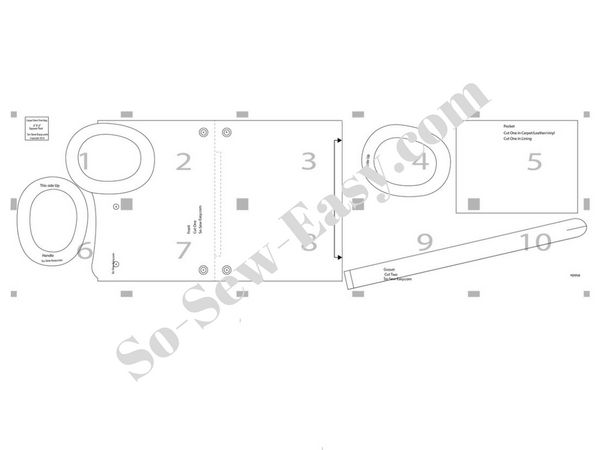 Sew the gusset at 1/8″. Use your pattern to find where to mark/pin the center of the gusset. My material allows me to use pins but if you are using vinyl or leather this is not going to be possible, use quilting clips or cloth pins instead. The final step is to make the strap. Cut the material the length you require. Mark the middle of the strap. I did not do this and it was hard to get the side even. Use glue to bring the sides to the middle then sew the sides down. 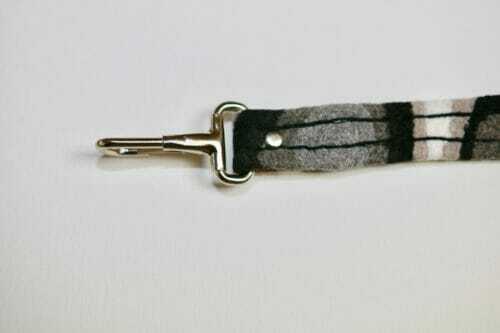 Thread the strap through the lobster claw, fold about an inch and attach a rivet to secure. 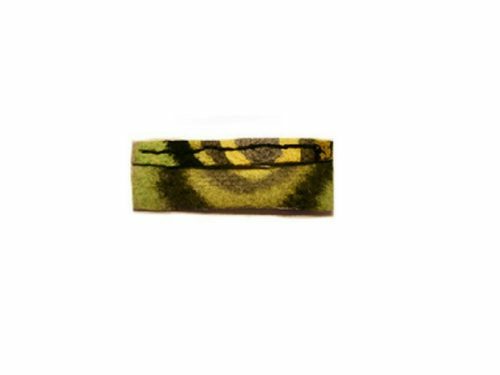 Material: I like working with the felted carpet material, it is strong enough to hold the shape without the need of any reinforcement. However, without the use of an industrial machine, I doubt that a regular sewing machine can handle sewing two layers together. Use only the materials suggested at the beginning of the post. Shape and Proportion: I am in love with both shape and proportion of this pattern but because of the size and print of the bag I would use it wearing a dress with no print or a monochromatic outfit. I would also add a couple of pockets and a removable zipper pouch as in this bag RFID fabric made with and a Marimekko print. I found when wearing it across the body if my computer was inside, it felt like the strips held by the rivets could be moved about an inch lower. Finish: I am going to have to give myself an F on the finish. I found that my stitching using the speedy stitcher was very uneven and sometimes crooked. It is very difficult to make the stitches look more professional even though I used a hole puncher except on the straps. I still need to figure out how to make my stitches look good. Got any hints for me? If you are wondering what are the snaps for, that is where I will attach a small crossbody wallet that I will be able to remove and use somewhere else. I have a little challenge for you, the first 5 people to load their finished bag in the comments will win a choice of a pattern from our pattern shop. So what are you waiting for??? I appreciate you trying different kinds of fabrics. I work for an interior design company and get all the leftover pieces and discontinued samples. I now have so many marvelous fabrics, but of course very few are quilting cotton. I’ve made several bags, (btw, your patterns are the best, and most easily understood) I’m always looking for new ways to use them. This bag looks very appealing, thanks! You are a lucky girl, Karen, what a lovely way to use what would otherwise end up in the dump and it costs you nothing and thank you from the bottom of my heart for reading the blog I am if anything happy to inspire you. I love this pattern, here’s a pic of my attempt. I used black and grey leatherette. Not sure where to get carpet material here! I am not quite happy with my handles so I am waiting to get more leatherette and I might just glue them and top stitch the top bits. The pieces to attach the long strap were a bit bulky for my machine and kept moving so I will have to revisit them too! Overall a great bag though!! Can’t wait to wear it out! Let me know when you get more material. yes, the handles are not easy, and it does get bulky on the straps. You will have to use rivets to attach the handle. I think this is a great concept, I loved the ring shaped handles on your carpet fabric and need a new bag so I accepted the challenge. The only suitable material I had on hand was a rather outdated and probably inexpensive leather jacket which made for a soft messenger style bag which I wanted but I still am able to use the full tote size when needed. One alteration I made was to shorten the overall length by 3cm just to fit across the jacket width but I like this altered size and the way the ring handle features when the top is folded down. I reversed the ring handles inside and out so that the darker suede contrasts against the leather outside and inside the leather handle contrasts against the suede. Thank you for sharing this experiment and I will let you know how I go with some scuba fabric when I purchase some. We have a first winner! Hi Lee, that looks fantastic! Thanks for all the feedback. Glad you could repurpose the jacket. Good example of finding sewing materials you already have. Please do let us know how you go with the scuba fabric. What pattern can I send to you? 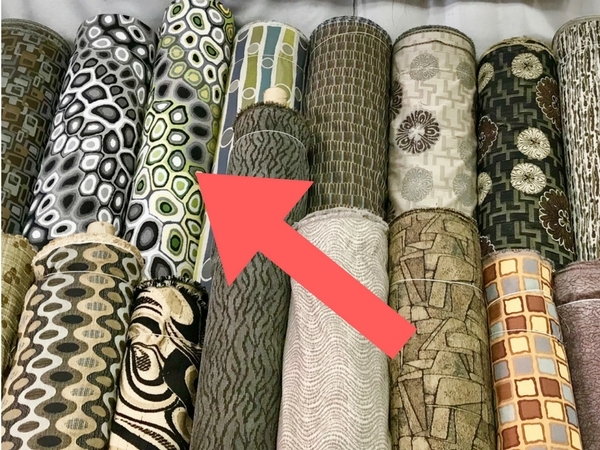 This keeps showing up in my pattern library on Craftsy as the Small Crossbody Wallet pattern even though it shows up in the cart as the Carpet Tote Bag. I have a huge stash of upholstery vinyl.. it wouldn’t be a flashy as this print but maybe if I do a machine embroidery design on it first. This definitely has my creative brain running. I know my machines can handle two layers of the vinyl, but if all else fails I have a antique treadle machine that runs and can handle it. I have been working on prototypes for a leather cell phone bag for 3 weeks. I found that making the bag in fabric in advance doesn’t help. Mainly because the big deal with leather is dealing with the bulk. I have several different weights, types and finishes of leather, each with its own challenges. I now have a working pattern, but yes I have wasted leather. However I have learned a lot and I believe the cost was worth it. As for getting straight top stitches, I have found the key is to sew slowly. I sometimes even hand wheel the stitching over the bulky areas to make sure I don’t lose control of the stitching. Like you said, you can rip it out but it leaves holes and weakens the leather. 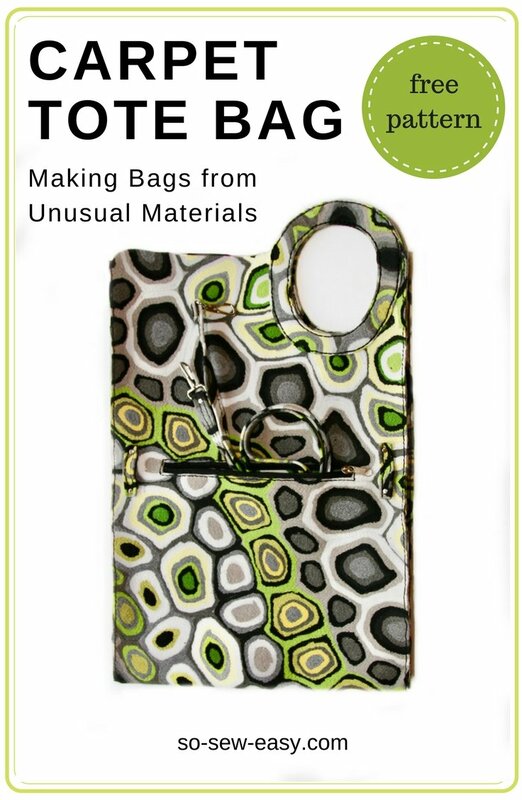 Your leather cell phone pouch looks beautiful. Can you share the technique and pattern. And your experience while making it. I am inquiring where you bought your carpet ? I love the pattern! What a fantastic pattern on that fabric or I guess I should say carpet! I think your project came out pretty good for an experiment. I think I may take you up on your challenge for a free pattern. Stay tuned. It will take me a couple days to pull this together but I’ll share my work with you.